This Donald Duck cartoon, funded by the U.S. government in 1943, urged Americans to pay their income taxes to support the war effort. Paying taxes was a patriotic act, to build up the inventory of war planes and battleships to defeat the Nazis – “sink the Axis!” the narrator bellows. Nobody liked paying taxes then, and they still don’t. Yet there was a growing awareness as the war played out in the 1940s that taxes – like saving your scrap metal – were necessary to advance the greater good. Things are different today. There doesn’t seem to be as much room in the public conversation for the benefits that federal taxes bestow, such as Social Security, Medicare, Medicaid (nursing home funding) and the Part D prescription drug benefit for retirees, or for government investments in education, roads, and research – or about who would suffer more if deprived of these benefits. Federal Medicare spending will increase sharply as baby boomers, with their longer life spans than previous generations, sign up in droves. The Social Security Trust Fund also reports that its reserves will be depleted in 2034, requiring either benefit cuts or new revenues to replenish a program that keeps millions of older Americans either out of poverty or just above water. These two programs currently account for about 40 percent of the federal government’s $3.7 trillion budget. Most people agree that we need to deal with the financial shortfalls in Medicare and Social Security. And there is precedent. Remember the bipartisan 1983 reform that put Social Security on firmer footing by increasing the program’s revenues and gradually raising its Full Retirement Age? 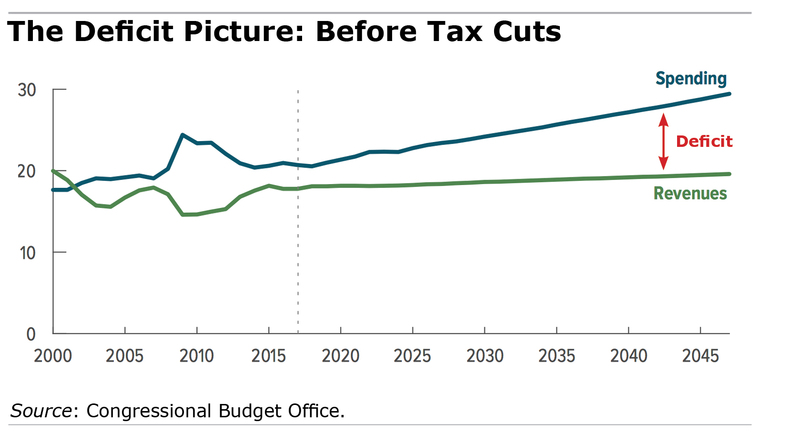 But there is growing concern among retirement experts and advocates for the elderly that the proposed $1.5 trillion in tax cuts will make future reductions to these critical retiree programs all the more likely in order to rein in growing federal budget deficits. 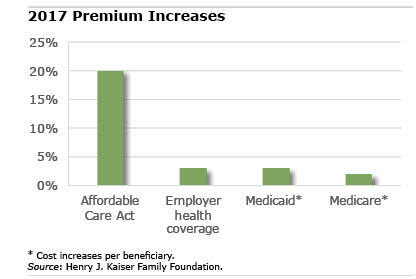 Americans with health insurance who are “under-insured” have more than doubled to 41 million since 2013. They now make up 28 percent of adults. Geographic disparities can be stark. Nearly one in three Floridians and Texans is under-insured, compared with one in five in California and New York. 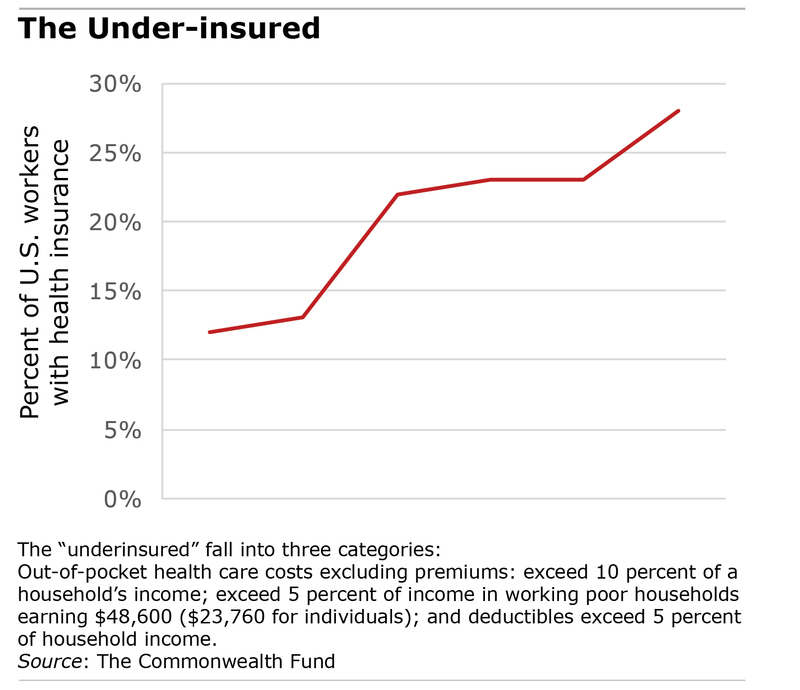 Not surprisingly, insurance deductibles are higher in Florida and Texas. Much has been made of the fact that many Americans can’t afford their deductibles and out-of-pocket costs when purchasing polices under the Affordable Care Act (ACA). The new report by the healthcare advocacy organization, The Commonwealth Fund, indicates that both ACA-insured and employer-insured Americans are frequently stretched to the limit. New Jersey’s retirement income exclusion for couples leaped from $20,000 to $100,000 in 2016. Minnesota and South Carolina now have income tax deductions for retired military. And Rhode Island started exempting the first $15,000 of retirees’ income from the state’s income tax. State taxes are one piece of the financial puzzle to consider when retirees – or Millennials – are thinking about moving to reduce their living costs, find a job or friendlier climate, or be close to the grandchildren. The Retirement Living Information Center recently compiled a nice summary of tax rates for all 50 states on its website. The information comes from sources like the Federation of Tax Administrators, The Tax Foundation and the National Conference of State Legislatures. State taxes vary dramatically. Alaska, Florida, and Texas are among the states boasting no personal income taxes, though some offset this with relatively high property or sales taxes. 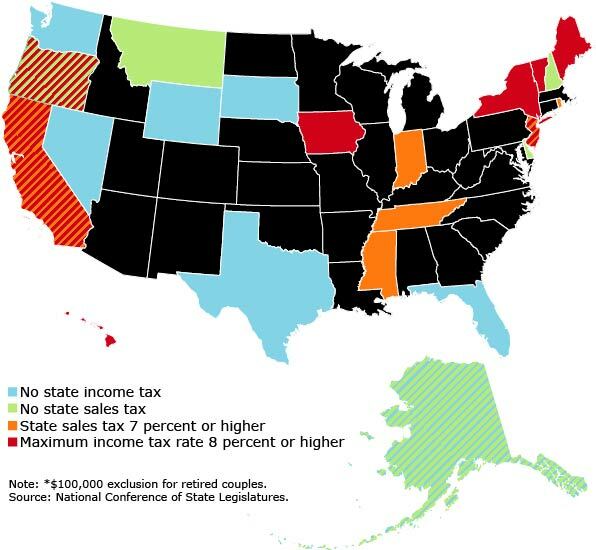 A few states – yes, Alaska again – have no sales taxes. Tax deductions and exemptions for retirement income are the norm, but they vary widely from one state to the next. The number of quality jobs held by workers with a two-year associate’s degree rocketed from 3.8 million in 1991 to 7 million in 2015. Total employment over that time didn’t come close to that rate of growth. “There are still good jobs out there for workers who don’t have a four-year degree,” explains the above video by Georgetown University’s Center on Education and the Workforce. These jobs, which require a bit more education and training than high school, typically pay $55,000 per year. When it comes to wealth, Asian-Americans aren’t much different than whites. The typical household’s net worth is around $133,000 in each group, and about 10 percent have no wealth at all. And like white America, Asian-American inequality is high and rising. Asian-Americans ranking in the top 10 percent (in terms of their wealth levels) have $1.45 million in savings and home equity – about 170 times more than those in the bottom 20 percent. In the 1990s, the top 10 percent had 75 times more wealth. A deeper analysis reveals the dynamics at work in this rapidly growing and diverse socioeconomic group. The timing of immigration is key to socioeconomic status. The Japanese, who came to this country in large numbers in the early 1900s, have had plenty of time to improve their lot. 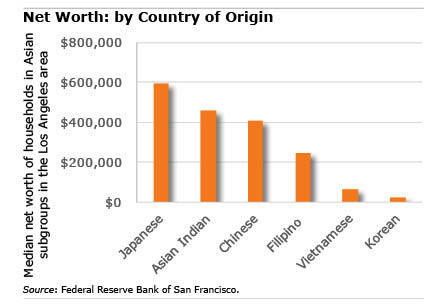 A new report by the Federal Reserve Bank of San Francisco, focused on the Los Angeles area, found that people of Japanese descent are, by far, the wealthiest segment of the Asian community there. Remarkably, the median household’s net worth approached $600,000 in 2014. Immigration from Korea, by contrast, didn’t pick up steam until the 1980s and 1990s. Not surprisingly, the typical Korean household lags behind, with about $25,000 in wealth. But that could be changing: one in five Koreans owns a business, the highest rate of business ownership for Asians in the Los Angeles area.